As gas prices rise, individuals are trying to find new ways to save money by using less gasoline in their day to day travels. Aside from public transportation, walking or biking, carpooling, or buying a new more fuel efficient vehicle, there are a few things that can be done to increase your miles per gallon. Changing the way you drive can help you save money while also making you a safer driver. Aggressive driving practices such as excessive acceleration can burn gas quickly and result in accidents. The information provided in this article can be used to help you drive safely and keep the number of trips you need to take to the gas station at a minimum. Aggressive driving practices include excessive acceleration, riding close to the bumper of other cars, and weaving in and out of traffic. The acceleration and frequent braking done by most aggressive drivers wastes gas. To drive more safely and save fuel, drive with the flow of traffic and don't always try to pass the cars in front of you. These simple driving practices can improve your miles per gallon by around five percent in town and 33 percent on the highway. Another practice that makes you a safer driver and also allows you to save fuel is obeying the posted speed limit. The majority of cars in production today are most efficient between 45 and 60 miles per hour. 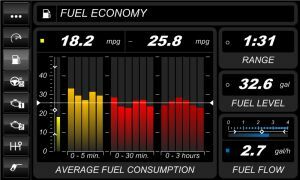 Once a car exceeds 60 miles per hour, fuel efficiency rapidly decreases, costing you more money to keep your tank full. For example, if gas prices are around $3.52 a gallon, each 5 mph you drive over 60 mph costs an extra 24 cents a gallon. When driving it is best to pack only what you need on any given trip. It is easy to over pack your car, especially on long trips. The problem with over-packing, is that for every 100 pounds of cargo, fuel efficiency is reduced by 1 to 2 percent. The smaller the car the more effected it will be by the additional weight. Many people believe that adding extra weight to the trunk of their car with bags of kitty litter or sand will increase the traction of their vehicle on icy roads. This is not necessary true. Many cars today are front wheel drive, and by adding extra weight to the trunk, the weight distribution at the front of the car is thrown off, in turn causing less traction, the exact opposite of the intent. This added weight can also decrease fuel efficiency. If you are traveling and planning to use a roof rack to cart gear, instead consider putting the gear in your car. Roof racks are not aerodynamic and can cause drag, or wind resistance, that will result in lower gas mileage. Only use roof racks when absolutely necessary. Also, remember to remove the racks from the top of your car when you aren't using them. Constant use of air conditioning in cars can result in lower gas mileage. When driving at low speeds consider opening windows or using your car's through ventilation system to keep cool. At low speeds the air conditioner in your vehicle can result in a 20 percent decrease in gas mileage. For maximum efficiency, try to avoid both the air conditioner and open windows, as open windows can result in increased air resistance. There are a lot of situations where a car is left idling. Drive-through restaurants, stop lights, and traffic jams are all situations where cars remain idle and use extra gasoline. Just ten seconds of idling can use as much fuel as it takes to restart an engine completely. This alone makes it more fuel efficient to turn the engine off while you wait. Newer hybrid vehicles actually shut down the engine when idling and restart the engine when the gas pedal is pressed to increase fuel efficiency. When taking long trips on a highway, cruise control is more than just convenient. Using cruise control and overdrive if your car has these two features can also help you save gas mileage. Overdrive allows cars to drive at a consistent speed with lower engine revolutions per minute (RPM). Overdrive also reduces noise and wear on your vehicle. Regular car maintenance can do more than just keep your car from breaking down; it can also allow you to receive the highest fuel efficiency possible. Regular tune ups, oil changes, and maintaining optimum tire pressure are just a few routine tasks that can keep your car running its best. Once a month make sure your tire pressure is not too low or too high. The optimum tire pressure for your vehicle can be found in your car's driver's manual or inside the door on the driver's side. If your tire pressure is below the optimum level, add air without reaching the maximum pressure listed on the tire itself. Over inflated tires can be dangerous. By keeping tires properly inflated they are not only safer, but last longer and allow for a gas mileage improvement of about three percent. Whenever possible try to avoid taking trips during rush hour traffic. Busy roads mean you will likely be braking more often and idling, both of which decrease gas mileage. If at all possible try to plan your trips so that you avoid main roads during heavy traffic times by leaving for your destination early. Leaving during a time with less traffic may also mean the total trip time is lowered.